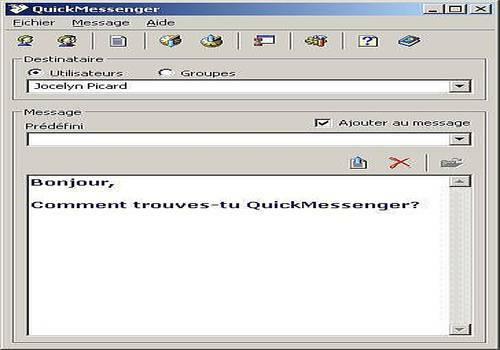 QuickMessenger is a utility designed to send and receive messages from one computer to another or to a group of computers via the local area network (LAN) under Windows NT, Windows 2000, Windows XP and Windows Server 2003. It uses the Windows "NET SEND" command, so you can send messages to anyone, even if they don't have QuickMessenger. QuickMessenger can also capture messages received by the "NET SEND" command (Message Display Service) to display received messages and you can reply to your sender.